Consumer Behavior 11 Edition For undergraduate and graduate consumer behavior courses. The text that set the standard for consumer behavior study. 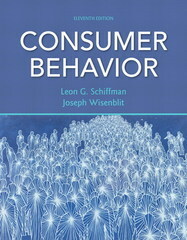 Consumer Behavior explores how the examination and application of consumer behavior is central to the planning, development, and implementation of marketing strategies. This program will provide a better teaching and learning experience–for you and your students. Here’s how: Improve Results with MyMarketingLab: MyMarketingLab delivers proven results in helping students succeed and provides engaging experiences that personalize learning. Bring Concepts to Life with Cases: End-of-chapter cases show students the real-life application of the concepts just covered so that they can see how real companies use consumer behavior to create marketing strategies, Global Coverage Focus: Discussions and examples appear throughout the text demonstrating the importance of cultural differences in both domestic and multinational marketing. Keep Your Course Current and Relevant: New examples, exercises, and research findings appear throughout the text. Note: You are purchasing a standalone product; MyMarketingLab does not come packaged with this content. If you would like to purchase both the physical text and MyMarketingLab search for ISBN-10: 0133131033/ISBN-13: 9780133131031. That package includes ISBN-10: 0132544369/ISBN-13: 9780132544368 and ISBN-10: 0132552000/ISBN-13: 9780132552004. MyMarketingLab is not a self-paced technology and should only be purchased when required by an instructor.